It is placed over the Bed or Bunk Bed Side rail where required to prevent Child falling off Bed, for extra safety if required. The guardrail is made to suit an approx. Foam mattress with a thickness of 150mm. 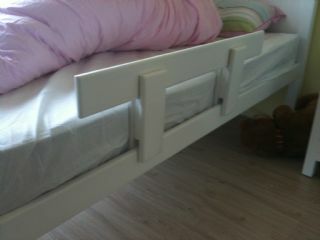 Should thicker spring mattress be used, On Request, a guardrail with a higher side, to match the thicker mattress. I do not specify the standard unit will be supplied. Specify under the “general comments” section on the enquiry check out form.